In college, Testaverde passed for 6058 yards and 48 touchdowns while averaging 9.0 yards-per-attempt and won the 1986 Heisman Trophy. Highly regarded and chosen first overall by the Tampa Bay Buccaneers in ’87, he moved into the starting lineup late in his rookie season. A big quarterback with a strong arm and fair mobility, Testaverde suffered with a poor team and was prone to poor decisions under pressure. He led the NFL in interceptions thrown with 35 in 1988 and 22 in ’89 and never had more TD passes than pickoffs in his six years with the Bucs. Testaverde signed with the Cleveland Browns as a free agent in 1993 to back up QB Bernie Kosar, his former college teammate who he understudied at Miami, but when Kosar was let go in a surprise midseason move, he took over as the starter with promising results, tossing 14 TD passes with just 9 interceptions. In 1994 he threw for 2575 yards and 16 TDs, although with 18 interceptions, and the Browns reached the playoffs. However, the club fell off badly in ’95, its last year in Cleveland, and Testaverde was benched for three games, although he achieved a new high by completing 61.5 percent of his passes and had a TD to interception ratio of 17 to 10. 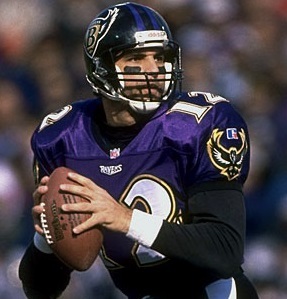 He moved on to Baltimore as part of the franchise reborn as the Ravens in 1996. Ravens went 4-12 to finish fifth in the AFC Central while ranking second in the NFL in passing yards (3978) and third in total yards (5723). Testaverde had a lesser season in 1997 and was waived, signing with the New York Jets in ’98 where it was anticipated that he would return to being a backup. However, he took over the starting job for 13 games, 12 of which were wins, and passed for 3256 yards and 29 touchdowns while giving up just 7 interceptions and compiling an AFC-leading passer rating of 101.6. The Jets reached the AFC Championship game and Testaverde was selected to the Pro Bowl. His 1999 season ended in the opening game with a ruptured Achilles tendon and, while he regained the starting job in 2000, it was with lessened mobility and a return to old patterns as he led the NFL by being intercepted 25 times. Testaverde cut his interceptions down to 14 while operating in a West Coast-style offense in 2001 and foregoing the long ball but lost his starting job to Chad Pennington in ’02 and, after one more year with the Jets in which he saw action when Pennington was injured, Testaverde moved on to Dallas in 2004 where he was a stopgap starting quarterback and led the NFL once more with 20 interceptions. He returned to the Jets as a backup in 2005, spent ’06 behind Tom Brady in New England, and finished up at age 44 with the Carolina Panthers in 2007. Over the course of a long and uneven career, Testaverde passed for 46,233 yards and 275 TDs with 267 interceptions. He was a first-team All-AFC selection once and was chosen to two Pro Bowls.